False killer whales (Pseudorca crassidens) are the third largest member of the oceanic dolphin ‘Delphindae‘ family, after the Pilot Whale and the Orca. 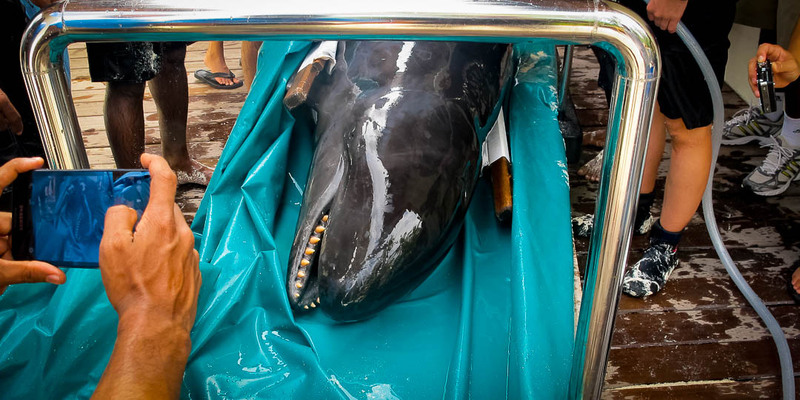 The average length of a false killer whale is 4.5m/15ft (females) to 5.3m/18ft (males), with a maximum weight of 1200kg (females) to 2200kg (males). Pseudorca live in tropical and temperate oceans, and are one of the most common species to be found stranded in shallow waters, both individually and as mass strandings. (1) Wikipedia (2) Society for Marine Mammalogy (3) IUCN Threatened Species™ (4) USA Marine Fisheries. 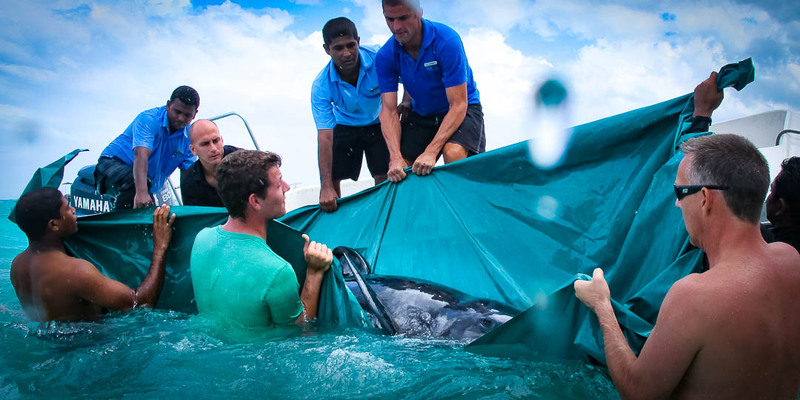 The 3.1m/300kg young-adult false killer whale was rescued on 9 December 2012, after being found stranded on the Resort’s staff beach. Despite our best efforts to push her back offshore, she was unable to keep her balance in the water, rolling weakly and dangerously on her right side putting her at risk of drowning. She was also drifting back towards the beach due to the dominant northeast winds and currents. 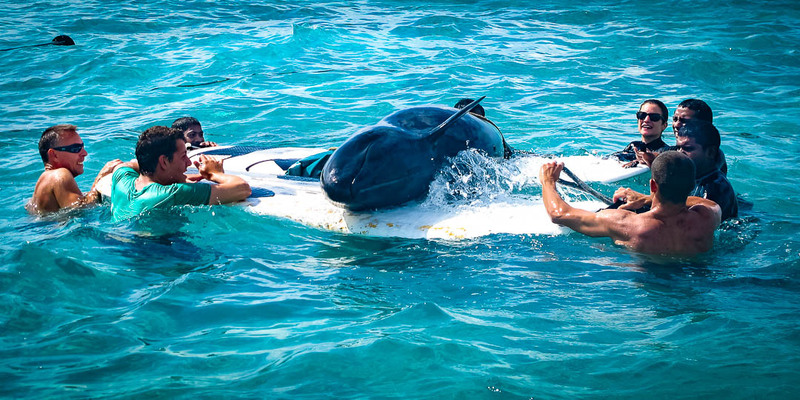 We used a small boat and two windsurf boards to tow the whale (nicknamed ‘Haita’) back to our Marine Discovery Centre at the other side of the island, a total distance of about 1km. During this time, Haita was weak, with shallow breaths and closed eyes, and she vomited several times. 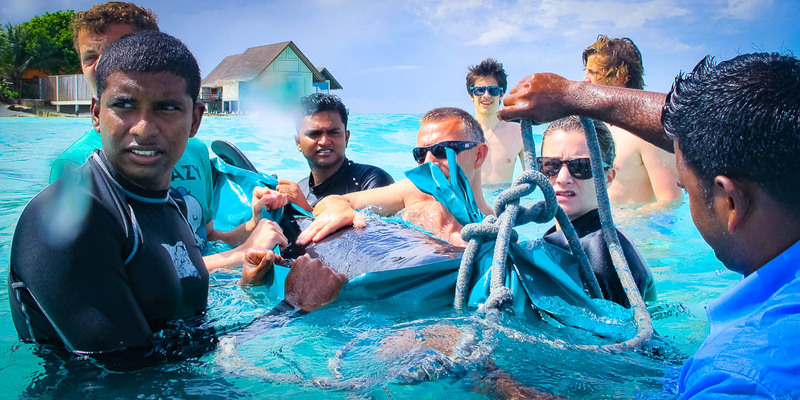 Assisted by ten members of staff, we used some tarpaulin to construct an emergency stretcher to carry Haita from the lagoon to our turtle rehabilitation pool (7m x 2m x 0.6m deep). 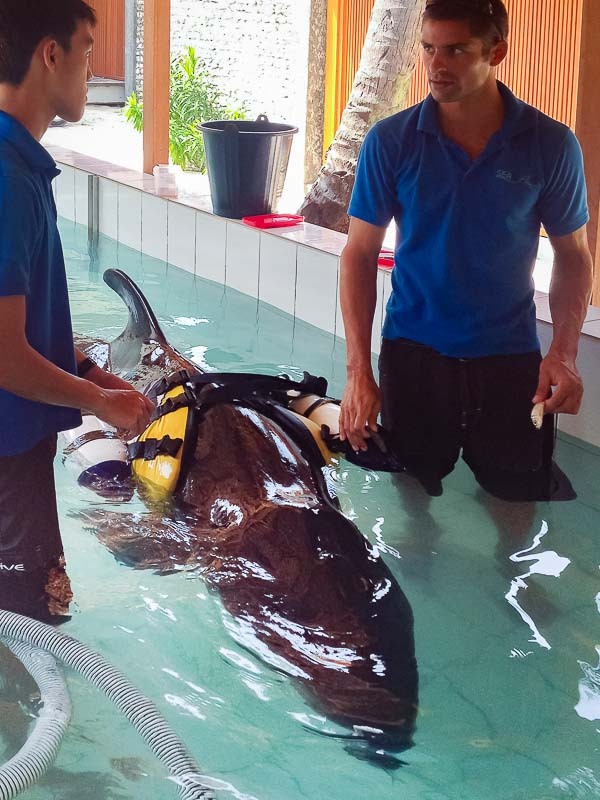 She was brought back to our Marine Discovery Centre where we quickly started putting a rehabilitation programme in place with the assistance of renowned international marine veterinarians. 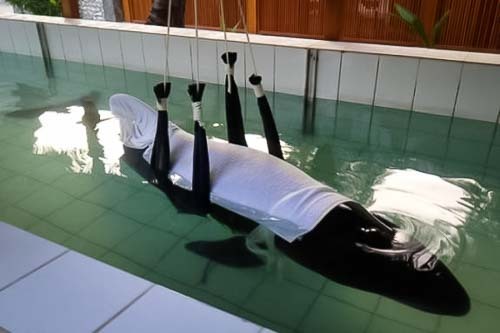 The first challenge was to build a sling support to maintain the whale in an upright position in the rehabilitation pool (made from a neoprene wet suit on a transversal beam). 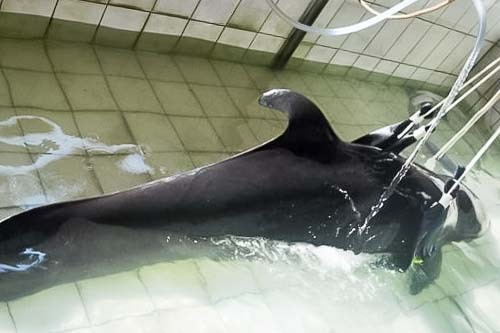 Then followed a near round-the-clock sequence of administration of fluids and food via tubing as well as injection of antibiotics, regular water changes, physical therapy to prevent scoliosis, cleaning of her wounds to prevent infection and regular correspondence with cetacean experts around the world to obtain more information on the possible causes of illness. 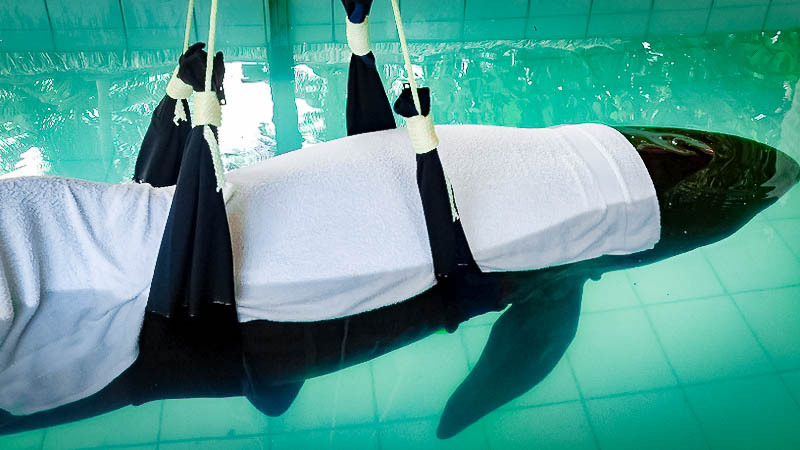 Our next challenge is to increase her diet from 5kg to 20kg of fish a day and, of course, to continue the efforts to help her regain strength and balance. It’s been an incredible process so far and we’re indebted to the support of more people than we can mention here, though in particular our remote experts Dr Bob Braun, Martin Haulena and Scott Gearhart. Haita’s movements were extremely limited during the first couple of days following her admission to our Centre. 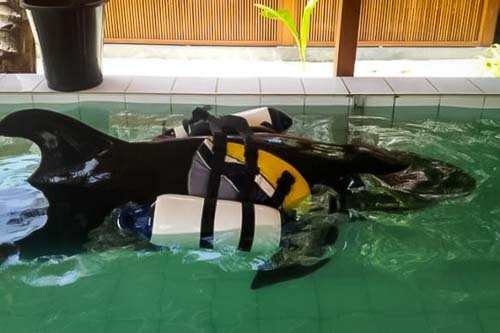 10th December – For 7 days, Haita was force-fed twice daily with a mixture of squid, fish, broad spectrum antibiotics, vitamin E and calcium supplements, and fluids containing electrolytes. 15th – We first observed signs of responsiveness (fluke movements). 18th – Haita started to take solid food by herself (10kg of herring, tuna, squid). 19th – Day by day health improvements and increased activity were observed. 20th – The sling was substituted for life vests. 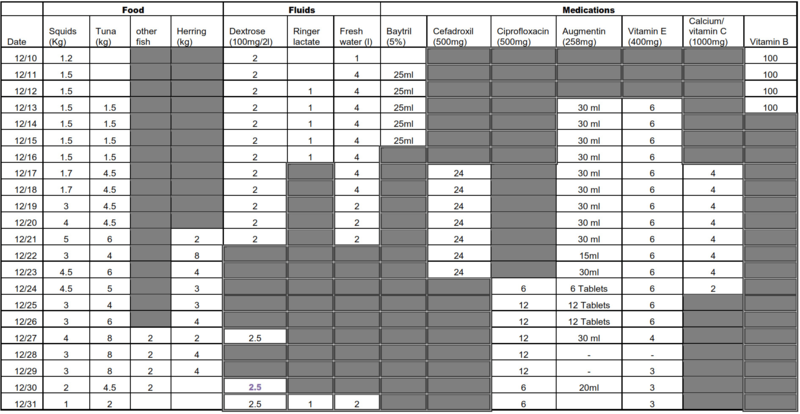 22nd – We stopped administering fluids, vitamins and calcium supplements (via tubing). 27th – Haita was first able to keep herself upright. 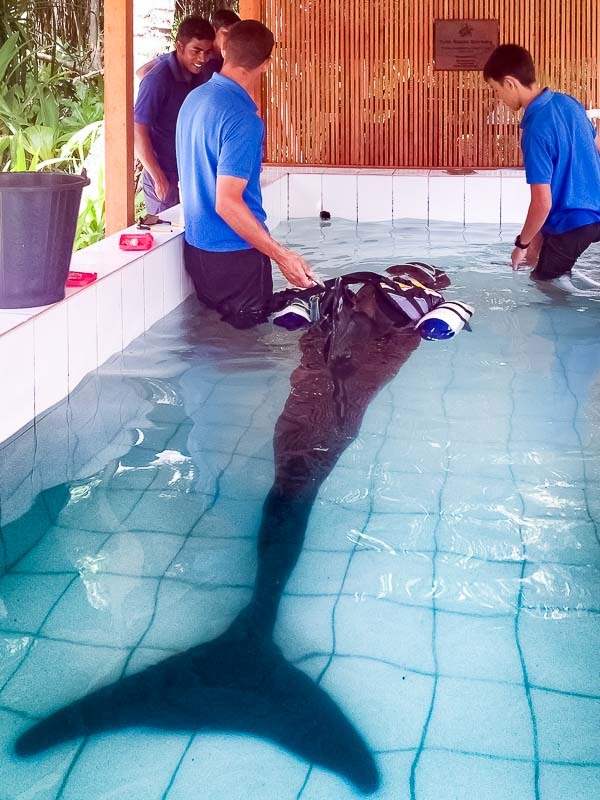 28th – We lifted Haita from the pool using our 10-man stretcher, and transported her via surfboard to a new lagoon enclosure. She initially appeared weak, with slow movements. 29th – Haita appeared much improved, actively swimming and whistling, and taking food by herself. 30th – Haita was much weaker again. For 2 days, we again administered fluids via tubing. As 2013 dawns, we are very sad to share the news that Haita lost her battle for survival on New Year’s Eve. 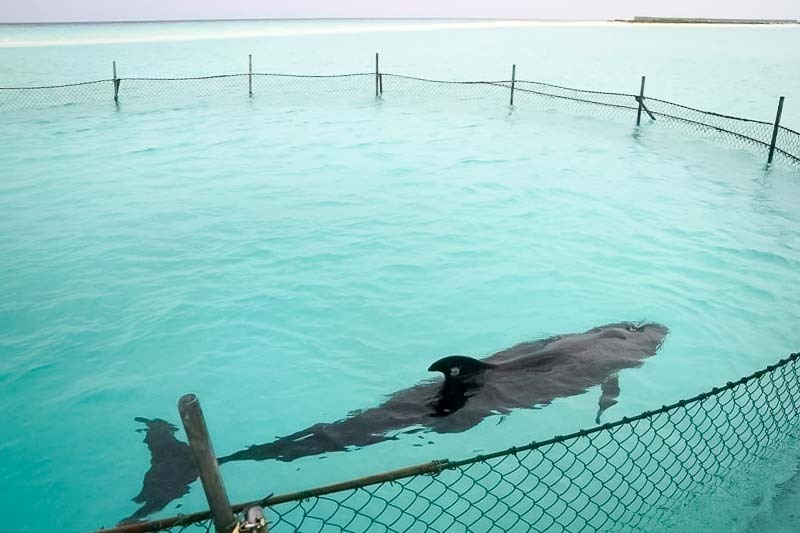 Having been transferred to a specially built enclosure in Landaa’s lagoon on 28 December 2012, Haita was showing much improvement in both her balance and her wounds. Unfortunately, however, her condition deteriorated rapidly on 30 December and on the morning of 31 December she convulsed and drowned. 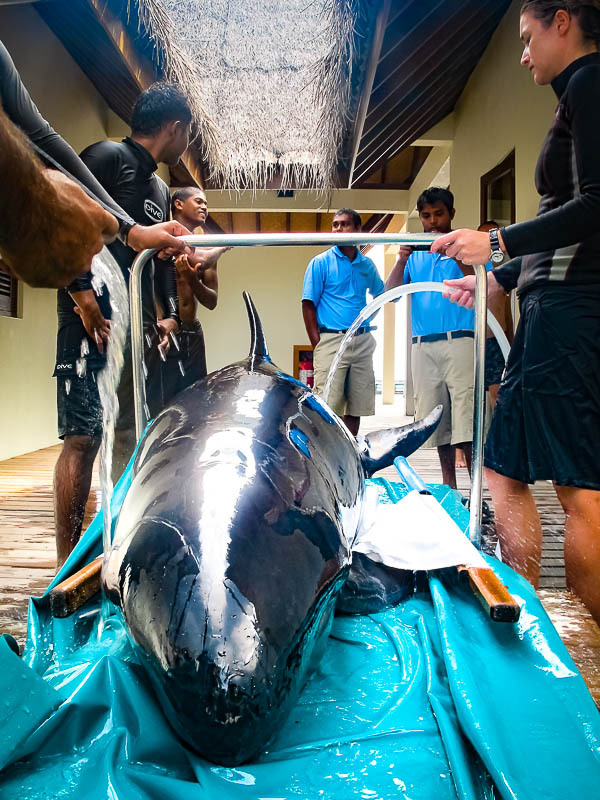 Blood tests from 29 December revealed a low level of haemoglobin as well as a very low level of alkaline phosphates that could have been associated with low dietary protein intake, inflammation from the pectoral fin injury, or other causes. We are awaiting the results of post-mortem blood samples, which will hopefully tell us more about the cause of death. 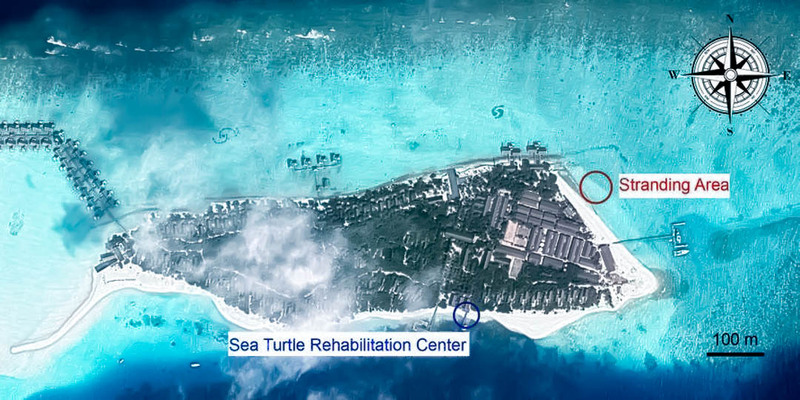 Our sincere thanks to everyone involved in this extraordinary rehabilitation attempt these past few weeks. 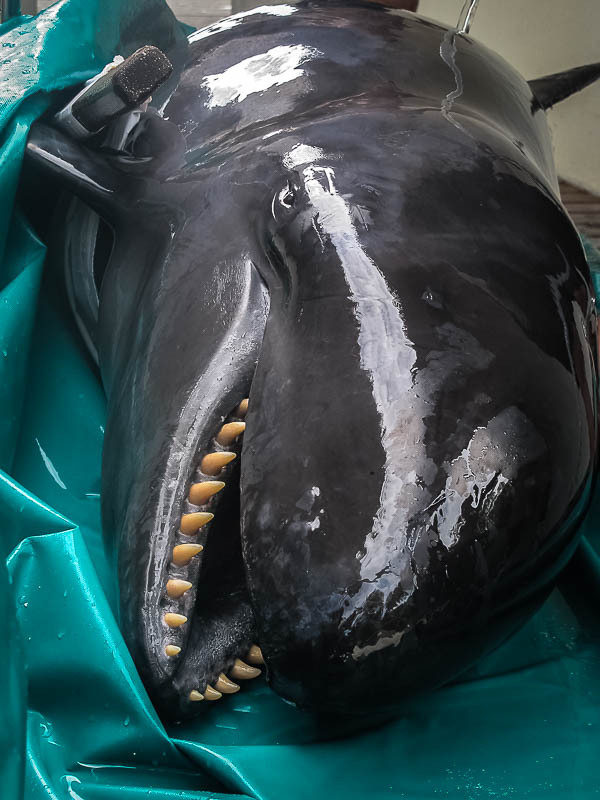 While we are devastated that we were not able to save Haita, we are already working on a protocol that will improve our ability to respond to cetacean strandings in the future. 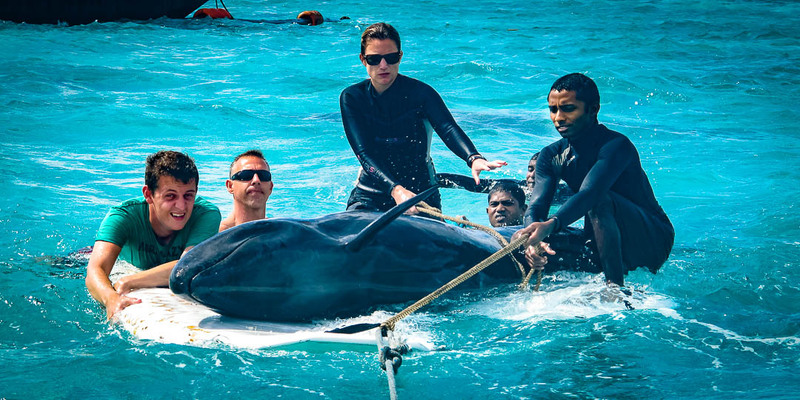 As far as we know, this was the first ever attempted rescue and rehabilitation of a False Killer Whale (Pseudorca crassidens) in the Maldives. Although we were sadly unable to save Haita, this proved to be a valuable learning experience for the whole marine biology team. To help share our knowledge with the wider scientific community, we have compiled a comprehensive report of our techniques, to be available soon. 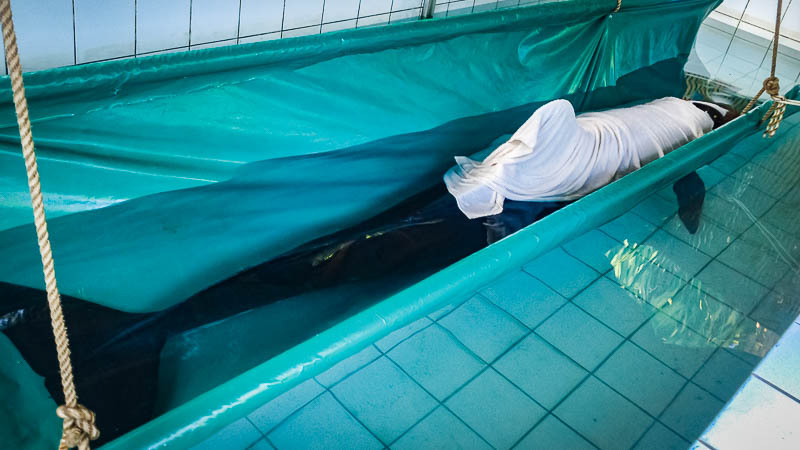 We are pleased to announce that Dylan Lau, our intern from Singapore, will be presenting our findings at the First SE Asian Marine Mammal Stranding Network Symposium, to be held next month in the Philippines (February 4 to 9, 2013 programme). LATEST – Dylan is back from the Symposium – read all about it in our special report.